As each month passes, it becomes clearer why God transferred me to this new school. We have a core Christian group of staff members who meet on Tuesdays and/or Thursdays at lunchtime for a Bible study. We share our personal struggles, triumphs, pray for one another, and sing uplifting songs. One of the more proactive members pushed through a “Follow Jesus” program to be available for students to attend on campus on Thursdays. Recently, one of the Physical Education teachers who has taught at the middle school for 30+ years revealed that her father was in the hospital suffering from congestive heart failure. Many of her co-workers prayed for God to comfort the entire family. Her dad passed away a few days later peacefully with his family around him. The following morning she shared this news with me and a student, Freddy when she saw us in the hallway. We both hugged her and expressed our condolences. I asked Freddy if he’d like to make a beautiful card for her to show our support and love. This young man created an artistic pop-up card (pictured) and presented it to this woman grieving for the loss of her father. 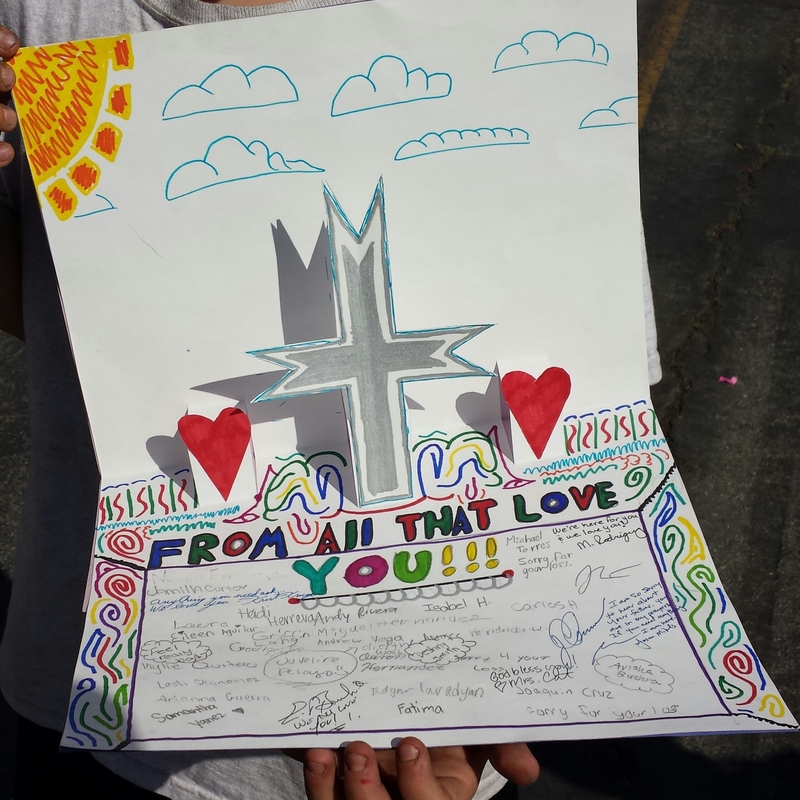 There were over fifty people who signed the heartfelt card. She was so overwhelmed with emotion when he handed it to her. It was such a genuine expression of love and compassion. I know it meant the world to her as it lifted her spirit up and gave her a sense of peace. It is already the second month of 2015 and I’ve waited over an entire month to write this blog. Over the Christmas break from school, my first international student arrived from China. Michael arrived in early January and I met him on his first day of school at the high school counselor’s office. As his Coordinator, I can rest assured because his current host family, the Alonzo’s, are simply wonderful and he is adjusting well to our culture. We all attended a fundraising event on his first Saturday evening here that featured Nick Vujicic as the main speaker. Most of us are familiar with this incredible man who was born in Australia without limbs and was called at an early age to preach the Gospel and share his heartfelt testimony with the rest of the world. Since that night, a transformation has already occurred in this young man’s life. He has requested to stay after school to attend chapel as well as expressing an interest in attending a men’s Life Group; an organization within the Alonzo family’s church. It is obvious that God has arranged for this young man to travel thousands of miles to California to be surrounded by people who demonstrate the love of God. Our Father is so magnificent and omnipotent! When we surrender to Him and pray that His perfect will be done, He will move mountains on our behalf.